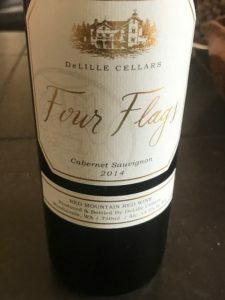 DeLille Cellars Crushes It with 2014 Four Flags Cab Sauvignon - Write for Wine: It's Wine O'Clock Somewhere!Write for Wine: It's Wine O'Clock Somewhere! The 2014 DeLille Cellars Four Flags Cabernet Sauvignon follows up the impressive 2013 vintage, and showcases the depth and structure resulting from Red Mountain grapes. Since its first vintage in 2010, executive winemaker Chris Upchurch has crafted a beautiful wine that becomes more and more powerful with each year. The 2014 Four Flags is inky in color, full-bodied, balanced, intense, and savory, featuring aromas of cassis, spices and minerality, followed by layered flavors of dark fruits, licorice, spice and a touch of flint. At $68 and a 93-95 barrel rating from Robert Parker’s Wine Advocate, this lucious Cabernet Sauvignon more than rivals its counterparts in Napa Valley, where Cab is King. To illustrate this point, DeLille Cellars conducted a study of all Cabs rated 90+ across five vintages in Red Mountain and Napa Valley. Of course, wine isn’t all about scores and ratings, not by any means. But this chart shows the relationship of points and price for both wine regions — and showcases the beauty and value of Washington state wine compared to our neighbors to the south. If you want a special-occasion wine, look no further than DeLille’s 2014 Four Flags. Or if you want to pair a seductively rich Washington Cab with a summer barbecue, this wine is for you. Four Flags is drinking amazingly well now, but will be even better with a few years behind it. We recently tasted the 2013 vintage at Northwest Wine Encounter at Semiahmoo Resort, and were fortunate to receive a sample of the 2014 vintage. This entry was posted in Cabernet Sauvignon, Red Mountain, Washington, Wine, Woodinville and tagged Cabernet Sauvignon, Chris Upchurch, DeLille Cellars, Napa Valley, Washington wine, Washington wineries, wine, wineries, Woodinville by Margot. Bookmark the permalink.